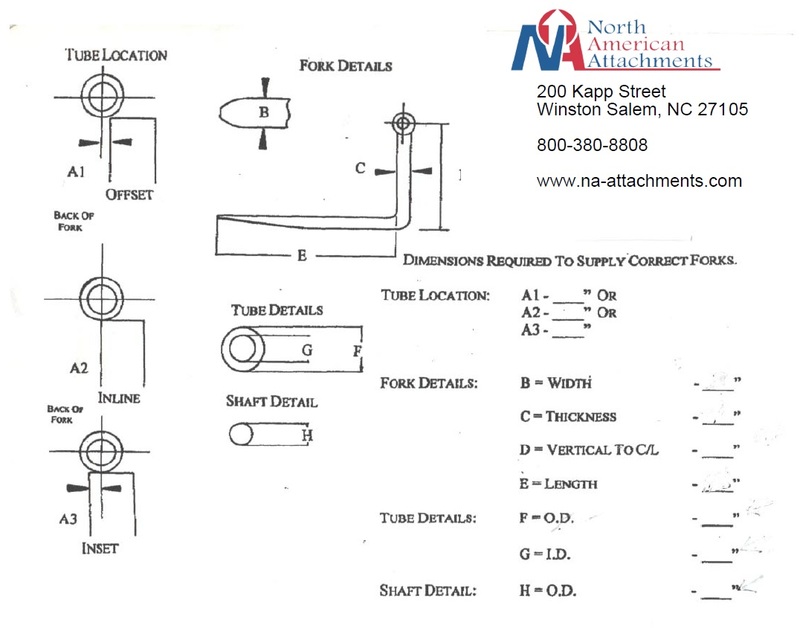 North American Attachments Buckets Forks are SOLID STEEL “FORGED” tines with a true 3:1 strength factor, unlike our competitors who use a channel or tubular construction. Our Bucket Forks will last longer. Two main points must be considered when selecting ‘FORGED’ Bucket Forks. The lift capacity of the forks should exceed the lift capacity of the machine, so the LOAD is limited by the weight of the machine, NOT THE FORKS. The back height of the FORK should be six inches or higher than the distance from the cutting edge to the top of the bucket. ALWAYS MEASURE BUCKET OPENING BEFORE ORDERING! Bucket forks sets are complete with 2 forks, 2” cold roll steel, stress proof shaft, locking collars and bucket hooks.